Unlike water features that just have water with plants surrounding it, water gardens actually provide an environment that can sustain and promote plant life growth within it. A well-planted water garden creates more movement in the yard, is a sanctuary for wildlife and gives you the feeling of walking out to your own private oasis. MFBG Horticulturist Maxine Marvosa will explain how aquatic landscapes can open up a new world of planting and landscaping possibilities. 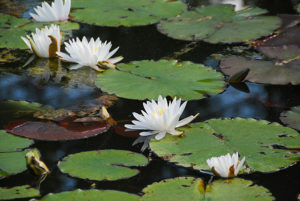 Join us on Thursday, June 6 from 10AM-Noon to learn how aquatic landscapes can offer a new dynamic to a garden area. To pay with credit card, click the button below or call 843-210-7582 to pay by phone.